Thanksgiving is about two weeks away and that means you will be using your oven once again to cook turkey and other tasty dishes. Here’s what to check if your gas or electric oven doesn’t bake. Gas oven does not bake. Check the timer controls. An automatic cycle setting could be preventing the oven from lighting. If you have an electronic display, try unplugging the oven to reset the controls. Most gas oven systems today use an electronic ignition to ignite the gas flame in your oven. An electric current will pass through the ignitor and the ignitor in turn allows the gas safety valve to open. It does this by heating an internal piece of bimetal to open the gas valve. Most times when an oven won’t bake, it’s because the bake ignitor has gotten weak or it’s just burned out. The ignitor is a small round or rectangular device located near the burner. The ignitor is wired in series with the gas safety valve. If this ignitor is weak or burned out, it won’t heat enough to lower its resistance to the point where the bi-metal strip gets enough electricity to heat up and allow the gas safety valve to open, and it will not release gas to the burner assembly. When this happens, you may have to replace either the ignitor or the gas safety valve. Many times it’s the ignitor that is to blame, and cheaper to replace. Gas Ignitors come in two basic types, ‘flat’ and ‘round’, and these parts are not interchangeable, so make sure you are ordering the correct part for your oven. You can do this by looking up parts by your Gas Oven’s Model number. The part list will show you the correct parts you need for your particular gas oven model. Read more about Gas Oven Glowbar Igniters and how they work. Check the controls and make sure the delay-cook or delay-start options are not running. Some ovens have a lock-out feature and the oven will not work until this feature is unselected. The most common reason for an oven not to bake is that the heating element is burned out. Check the bake element for continuity with an Ohm meter or simply look at the terminal ends for signs of corrosion. Look for obvious signs of burning, bubbling, or blistering on the element itself and replace the bake element if you see any signs of damage. A properly working element glows cherry red. Is your gas or electric oven having other issues such your electric doesn’t the oven bake or broil, but the top burners are still working or your gas oven oven bake or broil, even though the top burners still work? Find more oven repair help online at APWagner.ca. What appliance do you plan on buying in the next six months? Question: I have a Kenmore Washing Machine and when I turn it on it automatically starts to wash without filling with water. What’s wrong? pressure switch. This switch measures the depth of water in the tub. It does this through an air tight hose then runs from the outer tub to the water level control. As the washer fills with water, air is pushed up through the hose. The air pressure in the hose activates the water level control when the proper water level has been reached. A signal is then sent to the solenoid that closes the water-inlet valve and then power is sent to the timer telling the washing machine to start. The water control switch might have gone bad, i.e. burnt wires or it may be stuck in the “full” position. Be sure to check it and replace it if this is the case. Find washing machine no-burst fill hoses, pump to tub hoses, injector hoses and drain hoses at apwagner.ca. click here. Sometimes the air tight hose that runs from the outer tub to the water level control develops a pin hole leak. Check and replace this if it does. If the tube or diaphragm in this device has a slow leak, your washer may act oddly. An example would be that it fills and starts to agitate, fills more, goes back to agitate, and so on, leading to an overfill or overflow problem. If the tube or diaphragm in the water level switch has a really bad leak, the water level switch won’t detect any pressure whatsoever, and will not stop the water flow. For more information read: Why won’t the Washer stop filling yet it doesn’t get full? Cross border shopping: buying large appliances in the U.S. Some issues and questions to ask before your next cross border shopping trip. I saw in my blog stats that someone was searching for how much duty they would need to pay for appliances purchased in the U.S., so I thought I would try to find an answer to this question. In no way do I think this is an all-inclusive article. Also, laws and restrictions are subject to change, so it’s best to consult official government websites, provincial websites, and Canadian Customs websites for exact answers to your questions. What about my warranty? If I live and reside in Canada, but purchase in the U.S., will your warranty still be valid? First, get all information in writing. Don’t just rely on the salespersons advice. Before you go shopping visit the web sites for any manufacturers or brands you think you would like to purchase from and look up warranty information on those websites. Make sure the warranty is valid in the U.S. and Canada. Check the owner/user manual for the appliance in question for warranty information. Look for manufacturer 1-800 numbers for Canada in the warranty information. After you buy be sure to fill out the warranty information cards, as they may use this information in order to contact you in case of recalls or repairs. However, don’t leave it up to chance, make sure you keep an eye out for recalls and repair information on the government run Health Canada web site. To find about your warranty rights, check with your provincial or territorial consumer affairs office. If you are thinking about buying from a particular store in the U.S., check out their website for shipping information before you purchase. Some U.S. appliance sellers and stores do offer shipping and delivery to Canada, but with certain limitations and additional fees. For example, Orville’s is an appliance seller online and with stores in Buffalo, N.Y. Orville’s will ship to Canada, but certain terms and restrictions according to their Canadian Delivery page. Remember to factor in any additional costs into your final purchase costs. How are appointments for installation set up? What is the tax or duty I would need to pay when bringing a new appliance across the border? Do I need to pay PST and GST? According to the Canada Border Service Agency’s website, Items made in the North America (U.S. and Mexico) and that are for personal use are exempt from duty. Items made in Canada, the U.S. or Mexico are only subject to the GST (not PST) when entering Ontario. If you live in another province, or enter in another province, you need to check with that province as provisions vary. The longer you are gone, the more you are allowed in personal exceptions when it comes to duty fees. However, if you are gone less than 24 hours, you do not qualify for any exemption and must pay duties on all of your purchases. You can get around these foreign transaction fees by applying for a U.S. credit card or opening a U.S. Bank account. Can I get my money back on U.S. taxes I pay on my appliances? According to this website, the answer is no. The U.S. does not offer any such tax refund program for Canadians shopping in the U.S. If you have questions, your best bet is to talk to the store where you plan to make your appliance purchase. Most likely, they have probably heard and answered questions similar to yours. Did you real save money on your last U.S. shopping trip? Find out with this handy calculator. Question: My GE Clothes Dryer, Model Number: dclr333gt1ww, still squeaks after I replaced the little drum tabs. Where else should I look to solve this problem now? Answer: The first part of this answer comes from ApplianceAid.com. For GE Clothes Dryers that squeak, listen to the noise carefully, a slow or fast noise can help point you in the direction to look for the trouble maker. 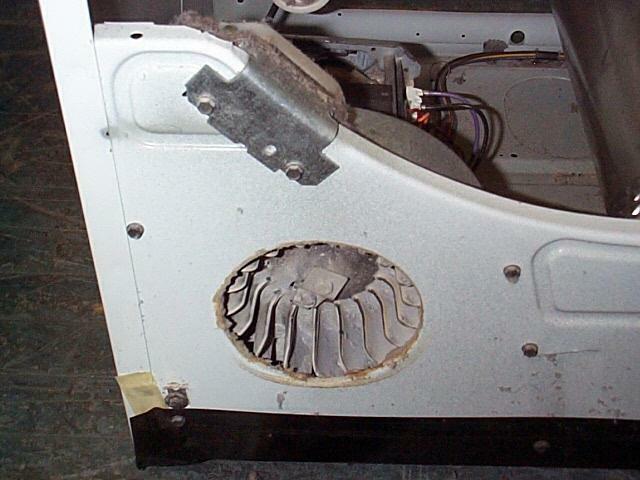 Slow squeaking or scraping noises: Check the front glides (there are 2 of them to change) or the rear bearing area, the rear bearing sleeve is inside the middle of the heater housing and the shaft part is attached to the back of the drum. Often times these parts wear out from normal wear and tear and simply need to be replaced. For example, a center spindle often supports the clothes dryer drum. This spindle may be a ball-and-socket support, or it may be a shaft inside a sleeve. When these component bearings get worn out, they may make a squealing or rubbing sound. Replace this bearing when it gets worn out. HowStuffWorks has some good, generic, instructions on how to repair and replace dryer drum rollers. Sometimes the Clothes Dryer’s blower wheel gets clogged with lint and it simply just needs to be removed. Other times the blower wheel wears out and needs to be replaced. Check inside the drum and make sure nothing is loose inside of it. Remove the lint trap and look below the lint trap holder for any loose items that may have slipped through the cracks. Make it easy on yourself, purchase a clothes dryer repair kit and get everything you need: 4 tri-rings, 2 support rollers, an idler pulley, a multi-rib belt, a clip, and instructions all for under $30 (not including tax and shipping.) It works on Whirlpool, Kenmore, Kitchen Aid, Roper, and other brands of dryers. Question: I have a Frigidaire Gallery brand washing machine, model number GLWS1233AS2, that is 1-5 years old. I replaced the belt a few months ago and it just broke again! What can be causing this? Is it the pulley that is the problem? Answer: Be sure you are using the correct belt on this style of washer. There are several different belts for this model depending on which model and year clothes washer you have. The belt is a cloth belt which slips in the spin mode and acts like a clutch. Something stuck in the clothes washer’s pump. Drain hose obstruction. The drain hose must be clear and allowing the water to clear machine properly. The rubber backflow flapper in the drain might be giving it some problems. Check this and make sure it is not the cause of your problem. Warped and wobbling transmission pulleys. These washers are known for the transmissions locking up in agitation and cooking belt…turning transmission pulley will free it again (like installing belt) and it will work for a couple loads….look at the transmission carefully.